The new Local Plan for the Harborough district – six years in the making – is ready for Government examination, councillors have agreed. Harborough District Council decided, at its full council meeting on Monday night, that its new Local Plan should be submitted to a Government planning inspector. The inspector will make amendments and return the plan to the council. Once it is finally adopted, the new Local Plan will set out planning policies in the Harborough district up to 2031. It will deal with strategic priorities for housing, employment, community facilities, transport and other infrastructure needed to support development. Councillor Phil King, deputy leader and portfolio holder for planning, told councillors that whist he accepted that not everyone will agree or like every part of the draft plan, the time had now arrived for it to be submitted to the planning inspectorate without any more delay. And he warned failure to submit the plan on time could result in the Government taking over planning in Harborough. “The reputational damage to the council would be immense” Cllr King said. Council leader Neil Bannister said the Local Plan was a “critically important document” and should now be “tested” by the Government inspector. The council’s large Conservative majority voted for the plan to be submitted to the inspector. The move was not backed by the Liberal Democrat opposition. 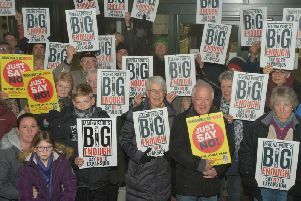 Liberal Democrat leader Cllr Phil Knowles said he was not convinced that the plan was “as robust as it can possibly be”. “There is still debate to be had; still decisions to be made” he argued. One late modification to the Local Plan also brought opposition from Conservatives in Lutterworth. The modification refers to “strategic development” in the countryside, and could – some observers fear – make future expansion of logistics hub Magna Park more achievable. Conservative councillor Rosita Page said this amendment flew in the face of local opinion. She said local people felt their opinions had been “totally, totally ignored”. But the council considered that the responses received from the public did not raise any issues of soundness that cannot be resolved during the Local Plan examination. Once the Local Plan is submitted to the inspector, a number of sessions may be held to consider it further, before a report is prepared into whether it is ‘sound’. The Local Plan is expected to be officially adopted by the end of 2018. It should then give the council a stronger voice on future developments in the district, including housing.